In February, U.S. Attorney General Eric Holder gave a speech in which he called America “a nation of cowards” because Americans did not concern themselves enough with issues of race. Now, a case currently under consideration by the U.S. Supreme Court highlights the need for public authorities to give race more attention. That case involves Frank Ricci, a firefighter in New Haven, Connecticut, who earned a promotion to lieutenant in the city fire department. Ricci studied for 8 to 13 hours a day to prepare for the combined written and oral exam, spent more than $1,000 buying the books the city suggested as homework, and paid an acquaintance to read them onto audiotapes because Ricci is dyslexic and learns better by listening. Ricci got one of the highest scores, and the city confirmed the test was unbiased. But of the top 15 scorers, 14 were white, one was Latino, and none were black. Consequently, city officials threw out the test scores and denied promotions to everyone because, they said, if the city did not promote firefighters in a racially proportionate manner, they could be subject to civil rights lawsuits. 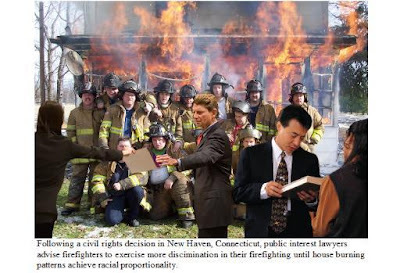 Now, local officials around the country are considering building on that civil rights agenda by disbanding their fire departments entirely until fires destroy a racially proportionate number of houses. “Beyond hiring policies, we’re concerned that fires aren’t destroying houses in a way that strictly reflects the race of home dwellers,” said one local fire chief, “so we may have to suspend fire protection services until we see more diversity in home combustion.” Another fire official added that, in her community, “the statistics show we need to wait until three more Asian and two more Latino homes are razed" until services resume. Local police officials have said they were also considering limiting patrols until they see a rise or fall in crimes in certain ethnic neighborhoods. States have begun to hire diversity consultants to recommend how they can encourage greater racial parity in misfortunes. Recommended options include helping to “spread the tragedy around” by requiring those who score high on tests that demonstrate their effectiveness in combating crime and promoting safety to take such tests again under hornet's nests, if their promotions would impair diversity goals.